This is my second experience of having a release week, and there aren't too many differences. Lots of fretting, hoping new reviews and/or publicity comes in, and hoping the reader response is positive. I had my very first live radio interview(s) on Tuesday, and aside from thinking don't curse don't curse can I get fined for saying 'damn' I thought they went well. And to all my new fans in Des Moines...what's up y'all??? Last night my parents hosted a launch party, and I hope to post some pictures later. It turned out the bookseller was the nephew of an author, Michael Wallis, whose book was instrumental in my research for THE GUILTY. That's gotta be a good omen, right? And yesterday was one of the coolest experiences I've ever had as an author. I walked into my local b&n to buy a fantasy baseball magazine (my draft is approaching), and of course went to the new paperback section to see if the stack of copies of THE GUILTY had been depleted since my last visit. I approached to find a random guy perusing the racks. He picked up the new James Patterson, read the back cover, then put it down. Then he picked up my book. I was less than three feet away from this guy, silently willing him to go to the cash register...go to the cash register. He read the back cover, turned it over a few times, then, sadly, he put the book back on the shelf. I go get my magazine, and as I'm waiting on line I look behind me to see, who else, the same guy from before. He's holding a book. I look closer, and it's a freaking copy of THE GUILTY. After I paid, I waited by the exit just to watch the guy pay for the book. He did, and thankfully I wasn't arrested. I've seen people pick up my book in stores before, but never witnessed someone actually buy it who wasn't related to me. Now I know what Nora Roberts feels like twenty times per minute. THE GUILTY: ON SALE TODAY! "...hair-raising...Tension mounts, bullets fly and Pinter's cool fusion of a new outlaw with blood ties to an old one hits the mark. The resolution is a ripsnorter, leaving thrill fans ready for the next Henry Parker newsflash." "Newspaper reporter Henry Parker returns in Pinter's exciting follow-up to THE MARK...a suspenseful and shocking tale that will leave readers clamoring for the next Henry Parker novel." a can't miss thriller, THE GUILTY is guaranteed to leave readers breathless for the next Parker mystery." "Readers who enjoyed Pinter's first book, THE MARK, won't be disappointed with his followup. It's equally topical and well written." The past few months have been incredibly exciting, as notices keep rolling in for my debut novel, THE MARK. --THE MARK was nominated for "Best First Mystery" by Romantic Times magazine. --The Strand magazine named THE MARK one of its best books of 2007. --THE MARK was optioned to be a major motion picture, with award-winning director Paddy Breathnach attached to helm. I'll be doing several appearances to support THE GUILTY. If you're in the neighborhood, stop by! THE GUILTY is available to order from Amazon and Barnes & Noble, as well at your local bookstore. A writer wouldn't exist without readers, so if you enjoy my books please recommend them to your friends and family. As I lie in bed with Amanda, ignoring another late-night call from my ex, a shot rings out in the New York night and a beautiful starlet dies outside the city's most popular nightclub. This is the kind of story I was born to chase—but I never dreamed this story began over a hundred years ago. Suddenly another life is taken, the bullet fired from one of the deadliest guns ever made. Both victims are highly controversial, their murders more like public executions. My search leads me into the twisted world of The Boy—a world defined by a demented code of honor and shocking, long-buried secrets of the world's most infamous outlaw. "...one of the best thrillers this year..."
I'm back from a short vacation. Batteries recharged, my skin only slightly crispy. And I have a freshly copyedited manuscript on my desk that requires urgent attention. In just one week my second novel, THE GUILTY, hits stores. I'm feeling butterflies just as I did when THE MARK came out last summer. These are slightly different butterflies, since as a writer you want to progress, write better stuff, and nobody wants to see the words "sophomore slump" in a review. The story for THE GUILTY is more complex than THE MARK. It required more research and a tighter hand weaving several storylines together, hoping all the threads created one taut narrative rope. So when I read reviews like this one, from Kevin Lucia in the Press & Sun-Bulletin, those butterflies do a happy little butterfly dance of joy. Film rights to Jason Pinter's THE MARK, about a young reporter who finds himself accused of murder and must clear his name while being hunted by the cops, the mob, and a ruthless assassin, has been picked up by Dublin based outfit Treasure Films. Paddy McDonald and Rob Walpole are producing with Paddy Breathnach (Shrooms, Blow Dry) attached to direct. The rights were sold by Joe Veltre at Artists Literary Group. Now having little more experience in the film industry than in waste management, I have no idea if a movie will ever actually get made. I'm certainly crossing my fingers. But I have spoken to the producer, who was very, very cool and excited and made it seem like a real possibility. True story: the producer bought a copy of THE MARK at LAX, read it on his flight, then called my agent. And I was at dinner for my Dad's birthday when the call came. Hopefully all of that bodes well, and you might see Henry Parker on the big screen. Email me at jason@jasonpinter.com with your mailing address and your choice of Guilty Pleasure from the list here. 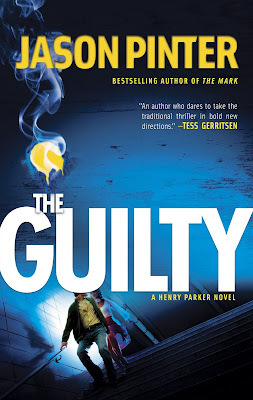 I'll also send over a signed copy of THE GUILTY, which won't be in bookstores until February 26th. Win your own GUILTY PLEASURE: Just One Day Left! You have until 11:59pm EST to submit your entry for the Guilty Pleasures contest. Entries have come in fast and furious from all corners of the globe, including New Jersey. There are less than 30 hours to submit your chance to win all the guilt-inducing pleasures listed here, as well as a brand new, signed copy of my second novel, THE GUILTY (in stores February 26th!). To enter, just post a comment on the original blog, or email me at jason@jasonpinter.com. Good luck! I was reading one of my local New York papers this morning when I came across a review for a new movie called "The Hottie and the Nottie." In case you, like me, had not heard of this "film," it's because it stars Paris Hilton. I'm not going to go into plot details, because it stars Paris Hilton. In an unironic manner. That's all you need to know. Anyway, I'm calling out all the legitimate newspapers who actually reviewed this movie. Is there nothing you could have done better with that space? Covered some underreported, deserving story? Hell, sold ad space? Book review sections are being slashed like a Freddy Krueger victim, and yet somehow legitimate newspapers still find room to vomit up 500 words on a Paris Hilton movie? Just despicable. If your local newspaper has sunk low enough to review this abomination, let me know and I'll add it to the list. And on a brighter note, there are 3 days left to enter the GUILTY PLEASURES contest. Either post a comment on the blog here, or drop me an email at jason@jasonpinter.com. Win your very own GUILTY Pleasure! In advance of the release of my second novel, THE GUILTY, today is the start of my "Guilty Pleasures" contest. Three winners will receive their very own assortment of Guilty Pleasures, sure to brighten up any rainy (or sunny, or boring) day. 6) any two of the following DVDs: "Say Anything," "Cocktail," "Can't Buy Me Love," "Pretty Woman," "Varsity Blues," "Dirty Dancing," "Road House," "Better Off Dead," "The Running Man," "When Harry Met Sally," "Bloodsport," or "The Princess Bride." 10) A one year magazine subscription to "CrimeSpree," "In Style," "Entertainment Weekly," "Vanity Fair," "ESPN," "Cosmopolitan," or a two-year subscription to "Esquire," or "GQ"
To to reiterate, three entries will each win a) a signed copy of THE GUILTY, and b) their choice of the "Guilty Pleasure" selections above. The contest ends at 11:59 EST on Sunday, February 10th. Please forward this to any friends or family members who might be interested (they might even invite you over to watch a DVD they win). So submit your entry for the chance to win your own customized GUILTY pleasure package!